This kofun is a short distance north of that tight cluster. It is associated with an Empress who ruled in the early 200s. 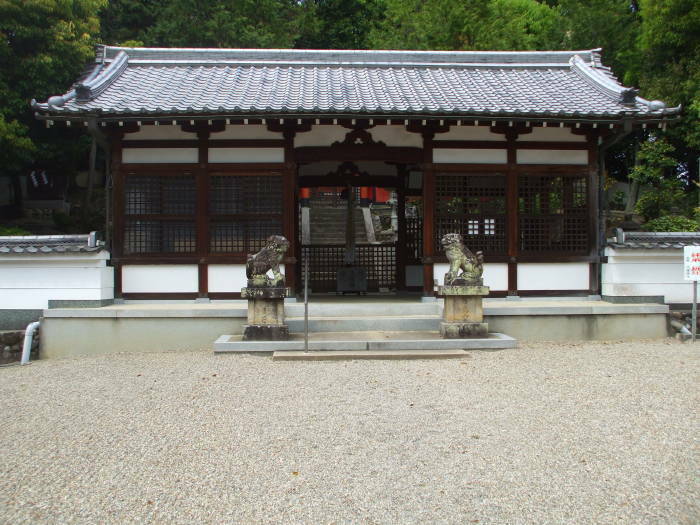 It is very unusual in that in 2008 the Japan Archaeological Society was allowed to make a brief visit. 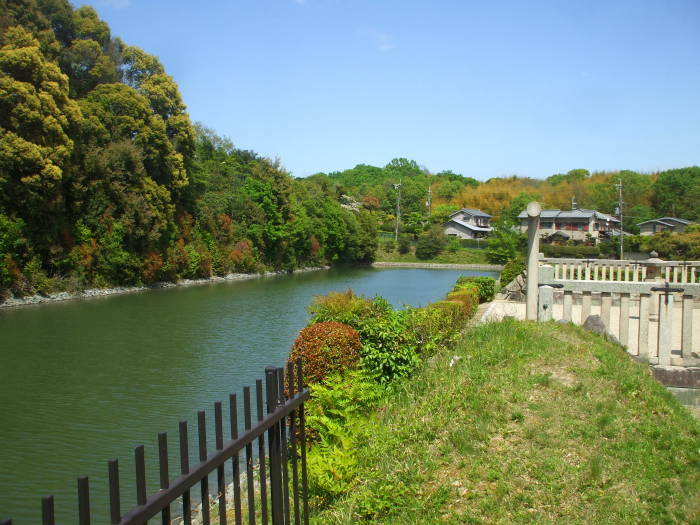 This was limited to a visit of 2.5 hours in which they were allowed to walk along the perimeter of the kofun and take some pictures. But still, that's far more investigation than the usual, which is none at all. 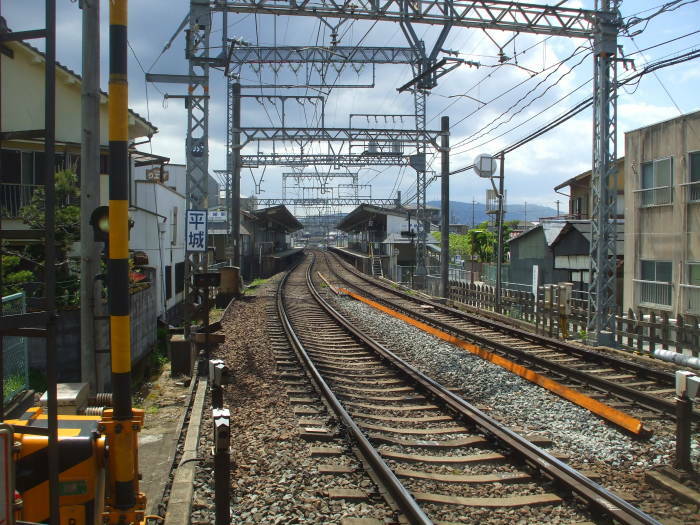 This kofun is a short distance north of the Heijo railway station, one stop north of Yamato-Saidaiji on the Kintetsu Kyōto Line. 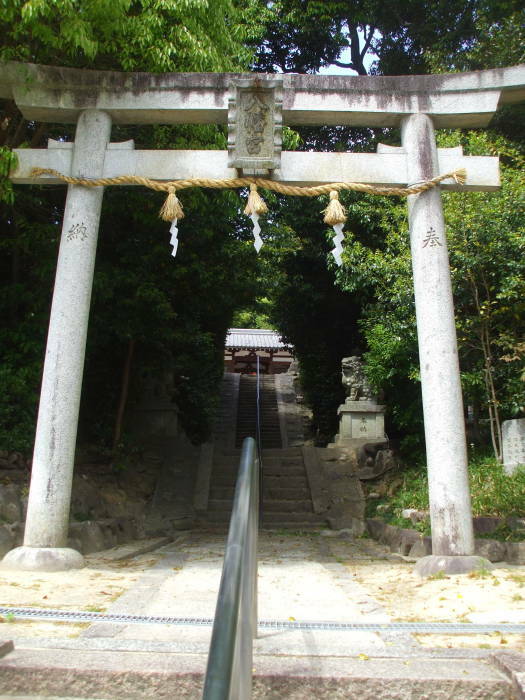 Just north of the rail line we come to a staircase leading up to the Sanryo Hachiman Shrine. 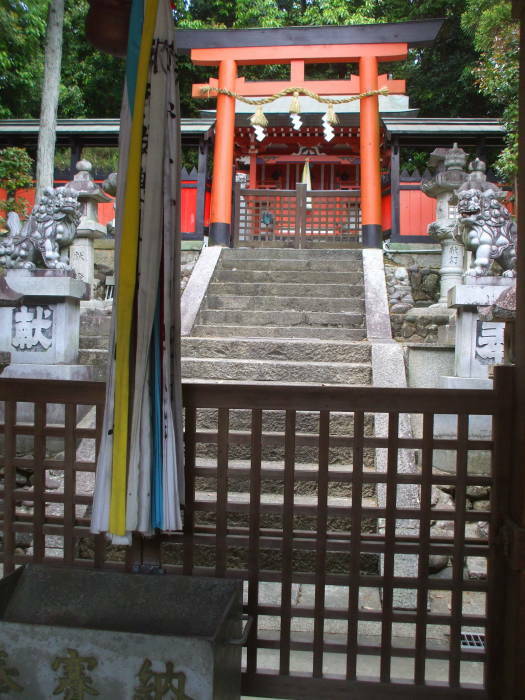 A shrine dedicated to the kami Hachiman is the second most common type of Shintō shrine. Hachiman is a deity of archery and war, combining elements from both Shintō and Buddhism. He is the divine protector of Japan, the Imperial House, and the Japanese people. 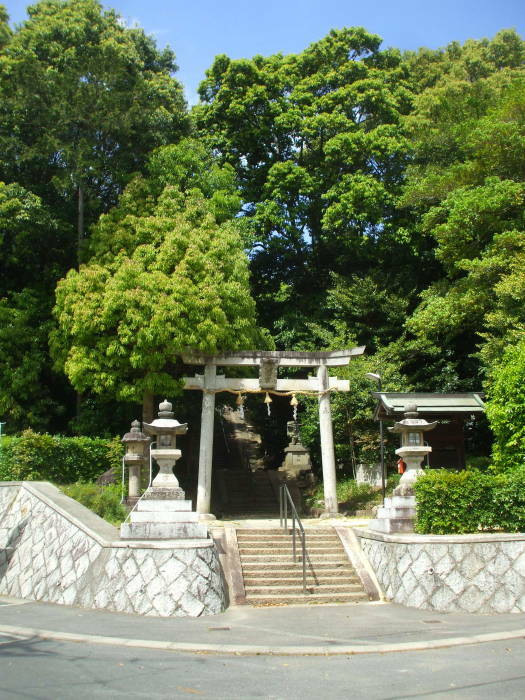 Belief in Hachiman dates from prehistoric times. 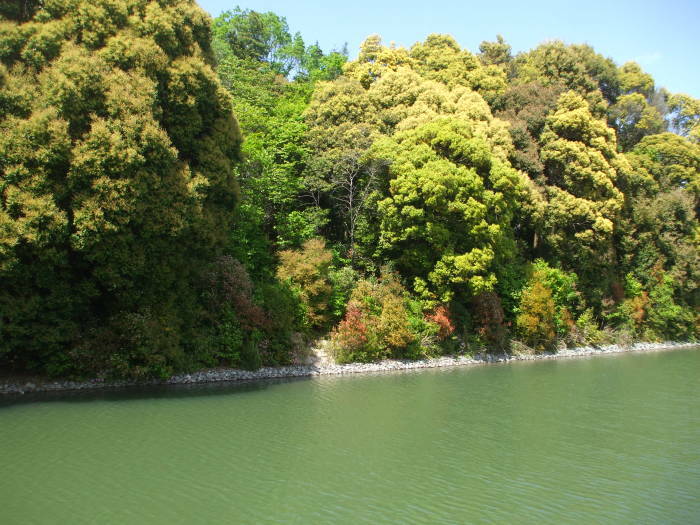 Not much is known about the kofun, beyond speculation that it was constructed around the end of the 4th century CE. There was some looting in 1849, but since then it's been strictly off limits. An Asahi Shinbum article from March 2008 (original Japanese article here) describes how sixteen archaeologists were allowed to visit the site for 2.5 hours. They were restricted to walking along the outer perimeter of the lower mound. They could look and photograph, but that was it. They did observe a previously undocumented ring of haniwa, terracotta tubes or figures used at times to form the edge of a tier. 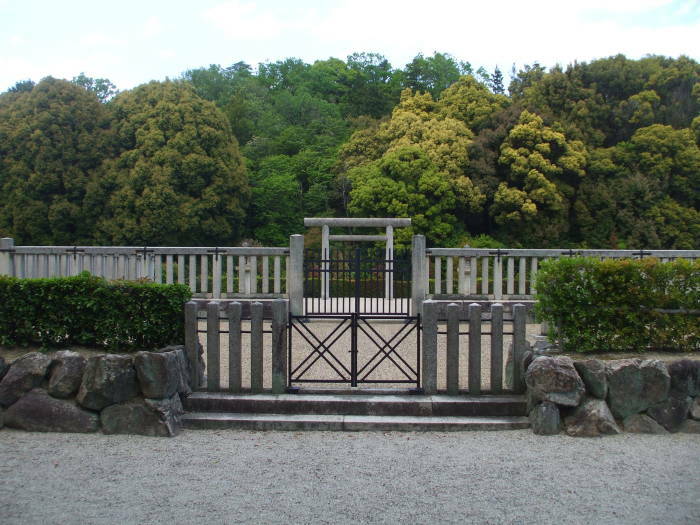 A similar Asahi Shimbun article from 2008 reports that a mound near Asuka was open to the public for 5 hours on one day. Empress Jingū was the consort to Emperor Chūai, who ruled from 192 to 200. When he died, she was Empress Regent until her son Emperor Ōjin took the throne in 269. He then ruled until 310. Yes, this is back in the realm of the Legendary Emperors. One version of the story says that Ōjin was conceived but had not yet been born before his father died. His mother, Jingū then went off on a military mission for three years, conquering some promised land which is speculated to be Korea. Then she returned to Japan and finished the pregnancy. Ōjin became Crown Prince at the age of four, and became Emperor at 70, ruling for the following 40 years. Needless to say, historians don't take that biography literally. Maybe a period of less than nine months contained three seasons or three harvests referred to as years. Or maybe the whole thing is a myth. Jingū is especially problematic because her mother, Kazurakinotakanukahime, was the descendant of Amenohiboko, a legendary prince of Korea. Through the years of the Shōgunate, the leaders were fine with the 15th monarch of Japan being Empress Jingū, who had some Korean ancestry. But with the re-establishment of the Imperial cult with the Meiji Restoration, when the Emperor regained power in 1868, Jingō was de-listed as Empress. Now there was Emperor #14, Emperor Chūai, ruling 192-200, then Jingū as Regent 201-269, then Emperor #15, Emperor Ōjin, ruling 270-310. Modern historians consider all of them to be legendary to some degree, with Ōjin possibly the first non-legendary Emperor depending on who you ask, but they say that Jinū was the 15th monarch, and starting with her son Ōjin the monarch numbering and Emperor numbering get out of alignment. As if to make up for her demotion from the list of Empress, in 1881 Jingū was the first woman to be featured on a Japanese banknote. Since there are no images or her, the artist used a female employee of the Government Printing Bureau as a model. Then that likeness was reused on postage stamps in 1908 (the first Japanese stamps to show a woman), 1914, 1924, 1937, and 1939.